***IMPORTANT*** Please be aware that by selecting "This is a Gift" option for any of the passes you purchase, the name will not display in check-out for those passes, nor will it display on the voucher when printed. If you wish for the individual names to show on each pass, please DO NOT click "This is a Gift". As well new in 2019 are "perks" for our season pass holder. Details will be sent to pass holders who provide email addresses. 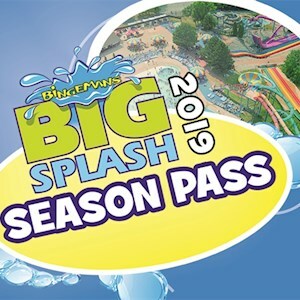 Big Splash Season Passes are only valid during the operating hours of the 2019 Big Splash summer season. Your Big Splash Season Pass is valid for Big Splash waterpark and FunworX 3 level Play Structure.